Species Native Range: Southeastern U.S. The low temperatures experienced this week in Georgia may have been damaging to other palms, but not the needle palm. 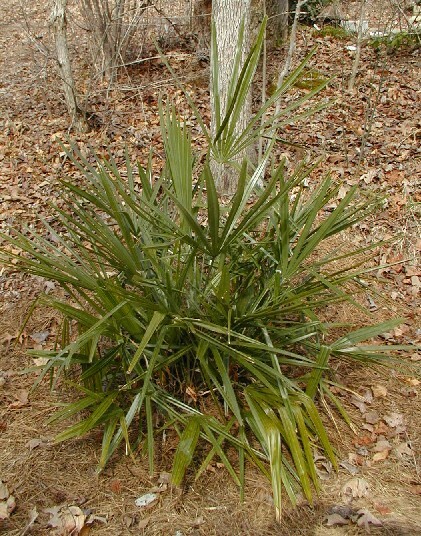 This plant can be found growing as far north as Boston with protection and without protection in Washington, D.C. Accounts vary, but established needle palms are reported to be hardy to as low as -15 degrees. Therefore, they can be grown throughout Georgia, even in the mountains. Needle palm will maintain a shrubby habit slowly expanding to its mature size. The plant gets its name from the nasty 6-inch (or larger) sharp needles that grow from the crown of the plant. As long as you don't reach into the center base of the plant, you'll be fine. Use needle palm as an evergreen accent or for a tropical look in a partial shade area, around pools, near ponds or at the edge of a woodland garden. It can also be grown in containers. Good companion plants include Autumn fern, Christmas fern, hostas, hellebores, azaleas, rhododendrons and camellias. For more information, visit the web site of the Southeastern Palm Society. Although I have seen or purchased this plant from the nurseries below, I cannot guarantee that they will have it in stock at the time this newsletter is published. If you have comments or questions about this article, please email me.